Body Transformation: Stepping Up His Gain Game! 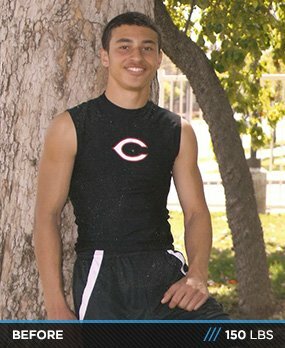 Bullies used to target Drew because he was thin and too smart. His best revenge was to gain nearly 50 pounds of muscle and solid respect! When I graduated from high school, I was 5-foot-10, 150 pounds, and stuck in a rough patch. I was constantly picked on for being mixed (black/white/Native American/Spanish), taking "smart people" classes, and not fitting in. I got pushed around, dealt with a broken leg, and was cheated on by my first and only girlfriend during my senior year. I missed out on nearly every social event and resorted to hanging out in the library so I wouldn't be bothered. As a smaller guy with nobody to watch my back, I was physically unable to defend myself against larger bullies. I tried to find my athletic passion through basketball and track, but never became great at either because I never felt the satisfaction I searched for in them. I looked at the muscular athletes and wondered how it felt to have that presence and the lifestyle that came with it. My friend who played football made a drastic change during one summer and put on significant mass. The reactions and respect he received sparked my interest to build muscle. I experienced many physically and emotionally damaging issues during this time, but acquired the motivation needed to make a change. I was accepted into college and determined to be a different person than I was in high school. 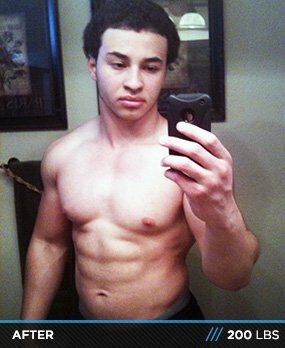 I started going to LA Fitness with my mom, followed workout routines from Bodybuilding.com, and the results came quickly. People in the gym started commenting on my physique after a few months of training, which encouraged me to train harder. My life started improving and I decided to take it further and get a coach (Denny Kong) when I moved to a UFC gym after training for a little more than a year. He helped me by being a cool friend and teaching me to tighten my diet and increase my training intensity. Denny's guidance took me from 180 to 200 pounds. Every day is stressful in a mental, physical, and financial sense, but I love what I do and have no regrets. The confidence, happiness, and purpose I developed through training are priceless. The positivity rubs off on others. My parents, brother, friends, and other family members now take their health more seriously after seeing my transformation. I plan to compete this year and hope to make it big. After six months of training, my gains suddenly stopped. I was frustrated with myself and thoughts of quitting started to enter my mind. So I took a week off and started to crack down on my diet. I pushed through and looked at the labels on everything I ate, counted calories/macros, and measured it all. This was the best lesson I could've learned because it taught me how much I needed to eat to continue my transformation and yielded impressive gains. I took photos of myself and set goals on my "vision board" so I stayed accountable to lose weight in given timeframes. You have to go there in the mind before go there in the body. I read online articles and Arnold's Encyclopedia of Bodybuilding, and watched YouTube videos on training and motivation. Dieting is the main reason I grew. I'm always on the go with school, work, and training. I always use Tupperware for whole food meals and a bottle for my meal replacement shakes. I don't get lazy and am always prepared. Coach and I change my training regimen week by week to confuse the muscles, but this particular plan is the foundation of what I do. The most challenging part of bodybuilding has been the financial aspect. Even though my parents help me out with a good portion of the food, affording supplements, coaching, and other odds and ends has been a struggle. My current job allows a limited amount of hours, so I'm adjusting to support myself almost solely through my eBay business. Managing my time is a challenge because of the stress with college, commuting, cooking, work, and life in general. My schedule always changes, but I find time to work out and eat. Setting reminders on my phone helped a lot. I plan to compete this year and hope to make it big in bodybuilding, fitness modeling, or as someone who can make a living in the fitness industry. I aspire to become a sponsored athlete and be on the cover of various fitness magazines which will lead to more opportunities in the fitness and entertainment industries. I currently study kinesiology so I will have the education to back my future endeavors. Don't compare yourself to others because there will always be someone bigger. Form and speed are more important than weight. Dieting is the most important part of bodybuilding. Don't let other aspects of your life interfere with your training. Don't be overly calculated; mix it up and keep it interesting. Keep researching and learning new lessons. Your thoughts create your reality; stay positive and be clear about your goals. Don't curl in the squat rack. Bodybuilding.com has been instrumental in my transformation. I found my first workout plan here and made impressive gains on it. Big Man On Campus videos by Steve Cook gave me insight to be a good student and step up my fitness game at the same time. The supplement reviews are helpful when buying supplements, and lurking in the forums has been a fun experience.